It's been a while since I have posted to the blog, so the beginning of 2018 seems like a good time to get back to it and wish everyone a very Happy New Year. 1.25 MILLION SUCCESS tracked in our database, HOLY COW. Never in my dreams could I have imagined we'd get there when I was coding away on the Request Tracking database roughly 19 years ago. 50,000+ members and almost 10,000 subscribers. SCN is the biggest community for sports autograph collectors anywhere, and you all make that possible. 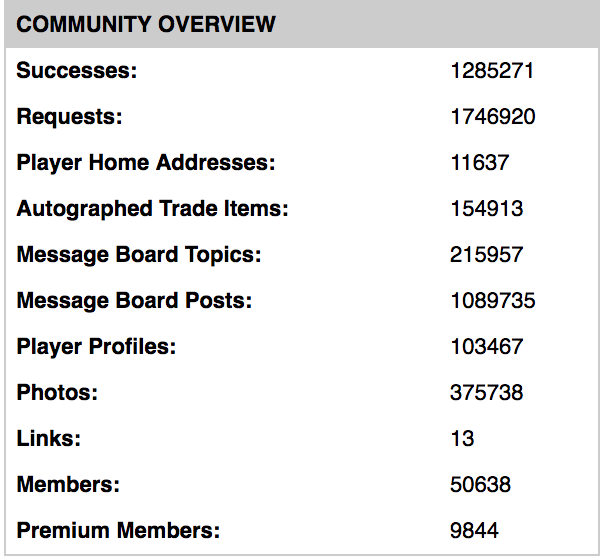 The community has made 197,657 completed collector-to-collector transactions in our Trade Manager. We suffered our first major unplanned outage. On December 27, 2016 at 3:51 AM, the hardware that runs this site failed massively and was completely unresponsive. The techs attempted several things, but multiple hard drives failed at once and any data on those machines was lost. This event caused the site to be offline for the 27 hours. Every night we back up all of the data you enter into our database and photos you all upload, so we were able to bring the site back. We appreciate everyone's patience. Everyone who had an active subscription or had tried to renew when the site went down, we proactively added an extra 7 days to make up for the day of downtime. I just want to thank everyone for all of the encouragement, support, concern. All the team rosters in all four sports are up to date 1948-Present. We added over 3 million card entries to our Card Set wantlist feature to get all four up to date with the 2017 editions. Enhanced the team and Hall of Fame Sigs by Mail to allow for filtering and sorting. Thanks for another fun and eventful year everyone. You guys make this the best community I could ever want as a fellow sports collector. The premium member who accurately predicts the winning team, final score, and MVP of the 2014 Super Bowl will win 1998 Ron Mix Hall of Fame postcards signed by Ron Mix.